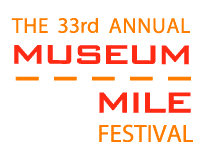 You don't want to miss The 33rd Annual Museum Mile Festival this year! One day a year, for the past 32 years, nine of the country's finest museums, all ones that call Fifth Avenue home, collectively open their doors from 6pm - 9pm for free to New Yorkers and visitors for a mile-long block party and visual art celebration. For what to wear to the biggest block party in New York, we went shopping at Bloomindales and found these vibrant tops to pair with your favorite pair of jeans. To find a style just right for you, visit our How to Wear Jeans post. And for the forcasted chill in the air, see our assortment of Summer Jackets on Sale.